Professional dental tool set, convenient to see, clean your teeth everyday. Care your teeth truely, protect your teeth with you together. Made from stainless steel, which have been designed to resist rust and corrosion. Professional design for comfortable handle, won&apos;t feel tired after long time holding. Reusable after high temperature disinfection, can be used for cleaning calculus, stain. 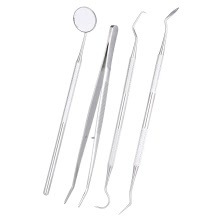 4pcs dental cleaning tools include anti-frog mirror, dental probe, scaler, and tweezers.